A team from the Faculty of Physics of Lomonosov Moscow State University has suggested using porous silicon nanowire arrays in highly sensitive gas sensors. These devices will be able to detect the presence of toxic and non-toxic gas molecules in the air at room temperature. The results of the study were published in Physica Status Solidi A: Applications and Materials Science. Taking into account high levels of environmental pollution in the modern world, it is important to develop sensitive devices able to identify gas-phase molecules accurately and selectively. However, the majority of modern gas sensors only work at high temperatures, which limits the scope of their application. Therefore, the development of reusable, highly sensitive gas detectors working at room temperatures is an important area of modern physics. 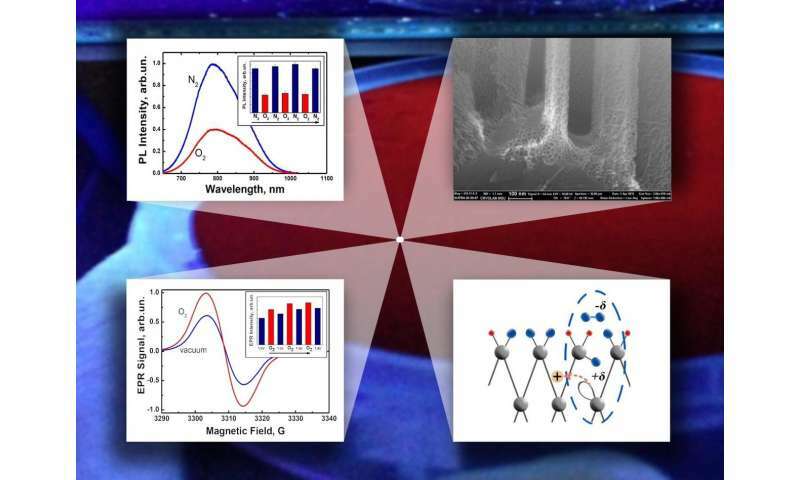 The scientists from MSU suggested using porous silicon nanowire arrays as sensitive elements of such detectors. They can be obtained by means of a cheap method of metal-assisted chemical etching. It is based on selective chemical etching, i.e. partial removal of surface layer from a bulk crystalline silicon with the use of metal nanoparticles as a catalyst. Moreover, the procedure is quick—at least 100 elements can be produced in a lab within just one hour. Each sensor consists of an array of 10 micron long organized silicon nanowires with diameters ranging from 100 to 200 nm. Each nanowire has porous crystalline structure. The size of silicon crystals and pores between them in individual nanowire, varies from three to five nanometers. Authors have shown that such porous nanowires have huge specific surface area due to which their physical and chemical properties are extremely sensitive to molecular environment. It was also found out that the obtained samples exhibited an effective photoluminescence in the red spectrum region at room temperature. "For the first time we've shown that photoluminescence of silicon nanowires is quenched in oxygen (O2) atmosphere but then restored to initial values in the atmosphere of a noble gas—nitrogen (N2). This is repeated in several adsorption-desorption cycles," said Liubov Osminkina, the head of the scientific group. The scientists explained the experimental results with a microscopic model according to which the sensitivity of optical properties of the samples to their molecular environment is determined by reversible charging and discharging of Pb-centers—defects such as silicon dangling bonds on the surface of the nanowires. The authors confirmed the model with measurements taken by using the electronic paramagnetic resonance method that helps determine existence and concentration of Pb-centers. "What's important is that our sensors based on porous nanowires both work at home temperatures and also are reusable, because the all observed effects were completely reversible," added Liubov Osminkina. The new sensors may be used both for effective control of environment pollution levels and for the monitoring of air composition in closed spaces, from classrooms to space stations.